The Mono Solar Water Filtration System is designed to remove bacteria, viruses, pathogens and suspended solids from water to provide safe water to remote areas. It brings together the proven Mono solar water pumping technology with GE’s Ultra Filtration technology to produce a reliable, self cleaning filtration solution. Available with either a stationary or GPS Tracking array, ranging from 150 Watts up to 350 Watts, these systems can produce up to 15,000 litres a day and meet discharge pressures up to 40m. The Mono Solar Water Filtration system provides its own power eliminating the need for diesel fuel or AC power. The system is easily automated to turn on or off by float switch or pressure kit. Once your clean water tank is full, the system will turn off, conserving water and reducing wear. The system will turn itself back on again when more water is needed. 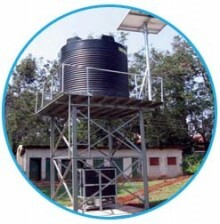 By using a Sun-Sub or Sun-Ray pump to feed the dirty water tank you will have a installations which requires no power. All water filtration systems are supplied complete with pre-wired solar modules, array frames and filtration unit. The entire package is easy to assemble and all electrical connections are fitted with plugs and sockets so electrical connections, do not require an electrician.